Lost amongst all the transfers this summer, the Milan clubs swapped strikers, which has been the most surprising and well planned by Internazionale. Interâ€™s 28-year-old Italian striker Giampoalo Pazzini suffered a poor year with the Nerazurri, playing in 33 matches and only notching 5 goals, and was to be one of many players offloaded in Inter’s summer reshuffle. At AC Milan, 30-year-old striker Antonio Cassano only participated in 16 matches, scoring 3 goals but assisting 10, because of health issues involving his heart – not a great first full season at Milan albeit due to health problems rather than form. Both clubs decided to send their star strikers packing as Cassano questioned Milanâ€™s ambitions after the sales of Zlatan Ibrahimovic and Thiago Silva to PSG and never really fitted in, while Inter wanted to cut all the dead wood loose after their poor season and underperforming Pazzini headed that list. The two former strike partners at Sampdoria swapped teams in what looks to be a relatively fair trade other than Milan also having to pay Inter â‚¬7 Million. Cassano is two years older than Pazzini and with his heart problems over the past year, is not an ideal transfer target so the extra fee does makes sense. Still, are the players that different in quality? Between 2008 and 2011, Pazzini did outscore Cassano with 57 goals to Cassanoâ€™s 36, their golden years both coming while playing as teammates at Sampdoria. This is not necessarily because Giampaolo Pazzini is a much better player in comparison to Antonio Cassano but rather their roles within the team were different. Playing in a more withdrawn role, Cassano was largely responsible for much of the good form of his striking partner, getting 28 assists to Pazziniâ€™s 4. While Pazzini is a penalty box area striker who is on the field only to score, Cassano is a forward who likes to run with the ball, has great passing and can play on the left wing with ease as well as fill a trequartista role. The best option seems to be having both play in the same squad as they did at Sampdoria but with much of Serie A going broke, that is not an option for either side. Italian national team manager Cesare Prandelli made his decision in bringing Cassano to Euro 2012 and leaving Pazzini behind after a disappointing season. Although Cassano had missed much of the year with health issues and is two years Pazziniâ€™s senior, he was not only selected to travel with the team but was chosen as Italyâ€™s main focal point in attack alongside youngster Mario Balotelli. While Balotelli scored a couple of wonder goals that caught the headlines, his performances were very hit and miss, picking up silly yellow cards, sulking, and disappearing from matches from time-to-time as Balotelli frustratingly can. Antonio Cassano is no stranger to controversy and had a touch of Balotelli in him during his younger years at AS Roma, but has since grown up a lot as a player and a person in recent seasons and despite modest statistics playing for Italy at the Euros, he was one of the most consistently excellent performers. 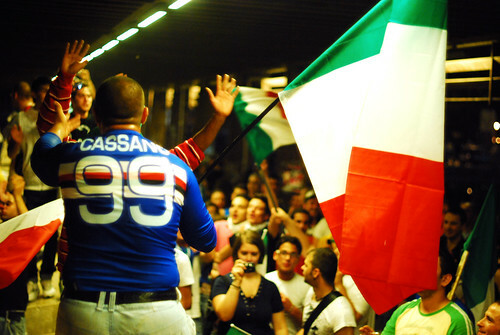 In his 6 starts, Cassano notched 1 goal, 1 assist, and 15 shots, while playing wide left and although those are not dynamite numbers, those who watched Italyâ€™s matches were rather convinced that he was their most potent threat in both a goal scoring and creative manner (although creativity marks will always be heaped mainly upon Andrea Pirlo). Prandelli, who managed to reshape the entire persona of the Italian team, knew that Cassano was the man to do this job and the striker proved him right as Italy surprisingly made it to the final only to lose to Spain. Pazzini stayed home and watched this all on his television, presumably. Both players have now played one match with their new teams with Giampaolo Pazzini making a far greater impression on his debut. Pazzini started as the lone striker for Milan and notched a penalty and two goals in the final 15 minutes to hit a hat trick for his new club in a 3-1 win over Bologna. Although this is only one match, he has already shown that he still has great goal scoring abilities and perhaps was worth the extra fee. Internazionale played Roma in their second match of the season, losing 3-1, with their only goal coming from a fortuitous deflection off of an Antonio Cassano strike.Â Despite his debut goal, Cassano came off in the 51st minute as not much was going right for Inter in the match. Inter manager Andrea Stramaccioni replaced the deep lying Cassano with Rodrigo Palacio to play up alongside Diego Milito, and this only furthered Interâ€™s problems in attack as both Palacio and Milito were trying to play in the same position, whereas Cassano would hold back and look to play in Milito who likes to play on the shoulder of the last defender. Pazzini is a pure goal scoring center forward, while Cassano is a trickier customer who may not outscore Pazzini but offers more options and can play more positions. Despite Cassanoâ€™s past heart issue, occasional disciplinary problems, and slightly advanced age, is he truly worth so much less than Pazzini? Milan seem to think so. Nevertheless, although Pazzini does often outscore Cassano by the end of the year, Inter have done a good bit of business in picking up a player that could possibly be of slightly higher quality (depending on who you ask) and a good amount of pocket change to boot. Either way it is good business by Massimo Moratti. You can read more from Jared on Field of View.